Great birthday & anniversary idea’s at the Southern Michigan Inns make wonderful getaway packages for happy couples. Here are a few samples for a romantic birthday and anniversary getaway ideas from two members of the Southern Michigan Inns. At Dewey Lake Manor, a Brooklyn Michigan bed and breakfast, one of their many loyal guests is a couple who have returned each year for the last 12 years on their wedding anniversary. Another couple who has made Dewey Lake a wedding anniversary tradition have gone back for the last 8 years. The gracious hosts of Dewey Lake Manor provide a anniversary gift of a complimentary rose and a bottle of wine or sparkling juice for couples who are celebrating their special day to enjoy. 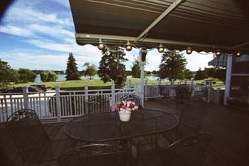 The 8 year couple returns the generosity by bringing a bottle to share as they all sit on the deck and enjoy the flowers and birds each June when they go to Dewey Lake Manor for their romantic anniversary getaway. Couples who are celebrating a birthday, Dewey Lake also has great birthday gift ideas which include a big cookie or a cake for two. Munro House, a Jonesville Michigan B&B, hosts Mike and Lori say that couples who choose the Munro House also will add one of their many getaway packages to compliment a special day such as an anniversary. A popular getaway package most couples choose is Munro House’s Romantic Getaway Package in Michigan with 2 nights luxurious lodging, 2 romantic dinners for 2 and 2 one hour rejuvenating massages. There comes a time when the best romantic gift idea is the gift of relaxation. Going to a conveniently located bed and breakfast and have the innkeepers take care of all the details is the perfect way to plan a romantic getaway. Your getaway package could also include fine chocolates and fragrant roses. One phone call does it all and the happy recipient of the gift might think you spent hours getting all of the plans arranged when in reality, it was done in about 10 minutes. Bed and Breakfasts make a great birthday, anniversary or other special occasion getaway ideas for couples all the time and are very good at being your personal concierge to creating a romantic getaway package that meets your desire. This entry was posted in Ideas and tagged Dewey Lake Manor, Munro House Bed and Breakfast, Special Event by admin. Bookmark the permalink.